Kurt Barnes is widely regarded within the Australian golfing fraternity as the player that has the game to get to and sustain a long career on the PGA tour. Kurt has grown up in Country NSW as a talented sportsman, with golf becoming his sole focus at the age of 16. Since then Kurt has represented his state and country in golf at the highest level and has made the often difficult transition to the professional ranks seem easy. Kurt’s nature and great personality has made him a well liked member of the Australian PGA tour for the last 4years, and with his prodigious long hitting and easy going nature the media interview him and TV cover him every chance they get. 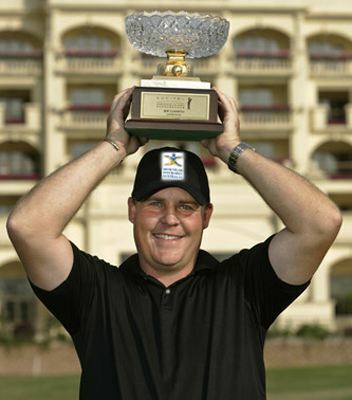 Kurt has had an illustrious amateur career and had many top finishes in his short Professional history, including a top 10 at the Australian open which he lead after day 1 in 2006. Kurt recently toured The Home of MDA meeting staff and Futures program participants and made an undertaking to “help make a difference”. During his visit Kurt accepted the position of MDAmbassador. “It’s an honour to become an MDAmbassador for MD as I have lost a close family member to Duchenne MD. Timothy Barnes born 15/12/82, died 18/6/98 from Duchenne MD. Tim’s parents Lois Perkins and Dennis Barnes were informed of Tim being affected by DMD when he was just 3yrs of age. My role as MDAmbassador will be to donate my time where possible, to chat to the kids and adults who have MD and also provide resource to help in the research for a possible cure for MD. I wish I knew about the MD research before Timmy passed away. Back then we knew very little about this disorder, but thanks to Boris and his staff at MDA in Melbourne, more is now known about MD and what needs to be done to make a difference.